"Best of South Jersey July 2009"
Our instructors have given us permission to display their lesson demo on our Website. Click on the "BLUE" dance links on the list below to see what it's all about and come out and join us. You'll want to dance your way to Dance Haddonfield after clicking here. We will be adding videos for the Hustle, the Night Club Two Step, the Quickstep and the Waltz. On October 7th, we again had the privilege of having hosted two more USA Dance World champions, from the Youth Division, 15-years old Sophia Levit & Mitchell Hayutt. In order to have their expenses to compete abroad reimbursed by USA Dance, these young dancers have to perform at a USA Dance venue. They selected Dance Haddonfield and drove from Brooklyn, NY in order to demonstrate their talent. They were absolutely wonderful! They glided, flew and danced so beautifully and so perfectly that it was a breath-taking performance. It was hard to believe that at their age, they had achieved such a high level of dancing – One can only imagine what they will be like when they get older. We wish them good luck in the competition which we are certain they will win. Below is the photo that was taken in our social room after their demo. On October 14th, Dance Haddonfield hosted Danielle and Kevin, 17 year old US champions, to our dance. USA Dance pays for their trip to Latvia for the World Championship in December if they give a demo at a local Chapter and we are it. They thrilled us with their performance - absolutely exhilarating!!! What a show!!! On December 9th, Daniel Zakirzyanov & Irina Yarovoi performed during our break. Needless to say, they were wonderful and everyone enjoyed their demo. They also stayed afterwards and danced with our members. We wish them lots of luck and feel confident that they will be winners at the dance competitions. Our Chapter has been honored and chosen for other Demos from other Dance Champions to demonstrate their talent and compete. 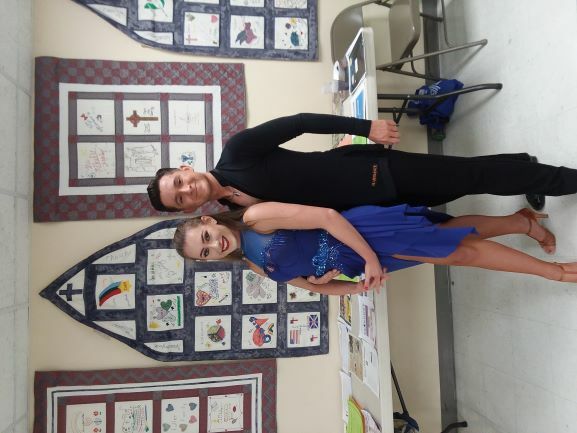 Please click on the link below to watch Marat Gimeav and Alina Basyuk glide on the dance floor as they will be the next to perform for us. STAY TUNED FOR MORE DANCE NEWS AT DANCE HADDONFIELD!!! ALSO PLEASE LIKE US ON FACEBOOK. THANKS!!! Lessons, food, refreshments and music: Just 10 dollars! Combined with Intermediate Lessons: Only 15 dollars! Effective June 24, 2018, because of a drop in our costs, we are cutting our admission price from $15.00 to $10.00. USA Dance Members will continue to receive a discount and will pay only $9.00. Come single, or bring a partner. Everyone is welcome. Beginner Lessons are from 7:00 PM to 8:00 PM and dance to 10:30 PM. Intermediate Lessons are from 6:00 PM to 7:00 PM. Who should attend our Sunday dances? We welcome adults of all ages who are interested in a friendly place to dance and/or meet new people. Social dance is a friendly, non-threatening environment. You do not need to bring a partner. We have group lessons and "mixers." Our beginner lessons and social dancing is a great form of exercise, a unique way to mingle, a way to ease grief and find joy in life. We encourage all people – singles, couples, widows, widowers, young, old – to join us any Sunday at Dance Haddonfield. For additional dates, click on "Schedule" at the top of this page. March 3 through April 7 - Tango with Gene LaPierre. Ludovico's is closed for Easter Sunday so we will be having fancy pizza instead. We are a non-profit, and need all the support we can get to continue our dance and to provide a pleasant environment at a reasonable price. Please consider donating to our dance; as part of USA Dance donations are tax deductible to the extent permitted by law. Sponsor an intermediate class – these run for 5 or 6 weeks. Sponsorship costs $60. 4 gift certificates, good for any new dancers (cannot be used by our current dancers). Mention on our home page. Mention in our weekly email newsletter in connection with that series of lessons. A sign posted at those lessons. Sponsor any one Sunday dance – cost $15. 1 gift certificate, good for one new dancer (cannot be used by our current dancers). Mention on our weekly email newsletter for that dance. If you want to help us the most, consider one of these sponsorships. Listed on our website for a year, and included on a plaque on display at the dance. Graded standardized curriculum for students of all ages. Junior and adult dancers learn social and/or Competitive Dancing in American and International Styles. Specialty Programs: Wedding preparation, wheelchair dancing, dance teacher training for certification. For more info contact Phil Zoebisch, Chapter President, at pszoebisch@gmail.com, or Joe Murphy, Chapter Treasurer, at jemurphy5730@gmail.com.